The latest update to the Google Search app for Android has brought some minor but noticeable changes to Google Now, the at-a-glance page on your Android Jelly Bean or higher device. The update was released over the weekend and if you look at the release notes, the only thing that is mentioned is “get new features, plus speed and reliability improvements“. Reasonably generic. However, there does seem to be at least two changes I have noticed in Google Now since updating and there may be others I’ve just not found yet. Regardless, version 4.7.13.19.arm for those keeping score at home is now in the Google Play Store and worth the small download to get the update. First, the Weather cards in Google Now seem to be much more accurate and reliable since I did this update to Google Search on my OnePlus One. Prior I would see a big difference in what these cards were telling me and what Accuweather, my dedicated weather app, would tell me. Basically it got the point where I didn’t trust the Google Now information as it rarely seemed to update. That has changed now it seems. In looking at the weather card and Accuweather, they are much closer in temperature information and the Google Now card seems to be updating more frequently. 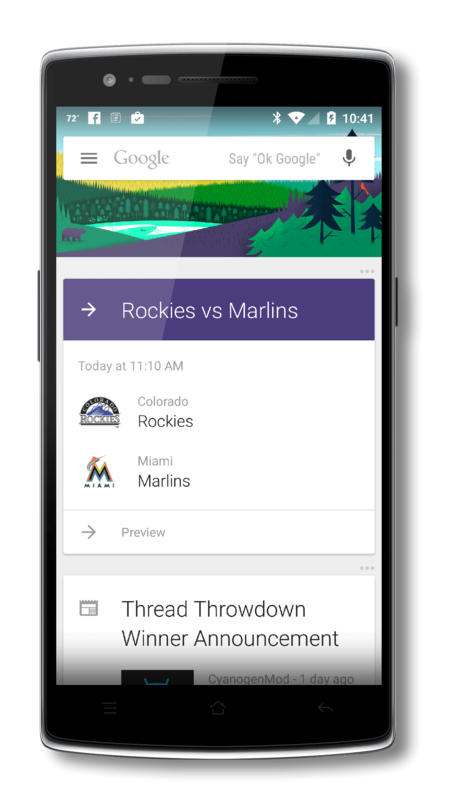 Second, I have setup the Colorado Rockies as my baseball team in Google Now it gives me information about the next game, etc. Now on the team’s card in the service, I not only see when their next game is and the opponent but I also see the team’s records just below it. As a baseball fan I like this and I’m assuming – although I don’t know for sure – that this information would appear in other leagues such as the NFL, NHL and NBA. Aside from these two changes and some general improvements when swiping to get to the Google Now page on my phone, I’m not seeing any differences. If you do however let me know by leaving a comment here or on Google+.